Grace Bell and I share the same enthusiasm for The Work. Grace is a certified facilitator, and has been writing a blog about The Work for as long, or longer, than I have. And she has a podcast. Grace and I got to know each other when we offered a retreat together at Breitenbush Hot Springs last June. When she suggested that we record a podcast episode together, I was happy to join her. I thought you might enjoy it too. Listen to the recording here, or subscribe to her podcast on iTunes. And check out what Grace offers on her website, including an online course called, Eating Peace, using The Work as a way to question the thoughts around eating disorders—an issue that she has recovered from herself with the help of The Work. in	What Is The Work? If this peacock does The Work, it’s probably going to find that it really is quite cocky. It’s not just that the other peacocks are off. He’s as prideful as the lot of them. So if you want to stay safe, don’t do The Work of Byron Katie. But if staying safe isn’t working for you, I invite you to question what you believe. Just be prepared. This work is not for the faint of heart. It is as gentle as gentle can be. That’s why I love The Work. I don’t know of a gentler way to see the hard truths about myself. But in the end, I’m still looking square at myself in the mirror. And mirrors don’t lie. And it has many tactics to keep the truth at bay: it may simply deny it, it may go into a renewed attack on the other person, it may tell a distracting story, it may stop doing The Work and go get something to eat, check Facebook, etc. When faced with the truth, the mind can get very uncomfortable. It may cause the body to shake, or nausea to happen. While questioning what she wrote on her Judge-Your-Neighbor Worksheet, she saw how demanding she was. She saw it in the situation she was looking at, and as a trend throughout her life. It was a clear view in the mirror. It shook her. She felt nauseated. And immediately the mind began to wriggle its way out of this uncomfortable feeling. She began to attack herself. It’s funny how the mind often chooses self-attack over standing in the truth. I made too big of a mess to be cleaned up. They just want to see me gone. I wasted so much time. I can’t admit to that. These thoughts could all be questioned. They are the distractions the mind puts up when it doesn’t want to fully sit in the truth, in this case, “I am demanding.” Just knowing that these are the mind’s distractions helps a lot. Questioning them can also help. I remember when I fully believed I was a nice guy. Now I know it’s not true. But coming out of denial was scary at first. And my mind did everything to avoid it. But when I could see and fully own the fact that I can be mean, I was free. Free because I no longer had to pretend. I didn’t have to keep up appearances of being a nice guy, and covering up when I wasn’t so nice. I didn’t have to cover up by blaming others when I was really at fault. That is the value of standing in the truth. It sets you free. But you have to really stand in it. A quick peek at the truth is helpful, but there’s no substitute for fully coming out of denial and owning it. That’s what The Work points to over and over in the gentlest of ways. The truth must be owned if freedom is to be gained. It takes courage. But it also takes awareness of how the mind tries to dodge the truth. When you’re aware of what the mind is doing, you can be gentle with it, yet not be fooled by it. Maybe you question the self-attack thoughts. Or maybe you see through them the way you can see through the manipulations and tantrums of a child, and gently guide it back. If peace is what you want, coming out of denial is medicine. Join us for my eight-week online course, The Work 101, starting in January. We’ll be uncovering a lot of beautiful, scary, freeing truths as we do The Work together. If I told you to peel all these apples, would it be too much to do? It’s a stressful thought I sometimes have as I try to balance all the different things I want to do. But each time I question this thought, I find that there really is not too much to do. And that I’m the one who gets to decide what I’ll do next. This seems obvious, but to really see it changes everything. If I say yes to everything, I will quickly have too much to do. But I really want to do all these things. That is the driver. This thought can be questioned. I want to do this, is it true? I want to do that, is it true? When I question my wants, I often find that I don’t really want to do some things. And that I’ll be okay if I don’t do other things. This starts to form a natural sense of priorities. But I have to do some things. These “have to” thoughts can also be questioned. It’s scary to question everything, but without questioning, I become a slave to both my “have to” list and my “want” list. I stop asking myself what I really want, and my life feels overcrowded and burdensome. I like to put my to do list on the chopping block sometimes. I question that “I have to” or “I want to” do each item. I’m not trying to be brutal (I find that I like being busy). This is only for the purpose of being more realistic in the limited time I have. It can be an amazing experience to question my to do list (both today’s list and my long-term future lists). I find myself changing the order of my to do list every day as I go through my day. I give myself permission to not do some things on my list, and to be willing to take the consequences of that (people not liking it). I do this for my own sanity because it’s not possible to do everything anyway, let alone do everything well. So I pick my projects and leave the rest. I no longer believe that “I can do it all.” So I make some decisions and live with them. It feels much better than the juggling act I’ve always tried to do. Learn how to question anything. Join us for The Work 101 online course. What is really bothering me about the weather here? Is it the fog? Or the cold? Or the darkness? Or is it the wind? And why does it bother you? Is preventing you from hiking? Or is it forcing you to dress differently? Or making you cold? Or is it depressing you? The first step of doing The Work of Byron Katie is to identify a stressful situation and to write down the thoughts that are bothering you. This can be done quickly or meditatively. Both are good. Today, let’s look at the value I find in slowing down and taking time to identify what is really bothering me. When I do this, I often find that my work really addresses the issue that is up for me and my turnarounds become very targeted medicine for me. Taking time to see what is really bothering me can be done when looking for one-liners or when writing a Judge-Your-Neighbor Worksheet. The approach is the same. It helps to find a specific instance where I had a stress reaction. This way, I’m not talking about my stress in general, but have a real live incident to write about. Once I’ve identified the situation and what was going on, I like to narrow it down a little further. What was the key moment in that situation that upset me? I can often narrow this down to one precise moment (though sometimes this is not so easy, and is not always necessary). Regardless of whether I can find a specific moment in my situation or am left looking at the situation as a whole, my next step is to identify who or what is causing my stress. Often, it’s someone else in the situation, but sometimes I may find that I’m blaming myself. Either way is fine. I’m just looking for what is really bothering me, and I trust that. This is what is really bothering me. So I trust that. I write my worksheet on her interrupting me. When I look closely, I often discover that I have a number of interpretations lying underneath the statement of fact. These are usually what are driving the emotions that I’m feeling. These are what make it personal for me. I find it very valuable to take some time to identify these interpretations. I usually make a list of them before even starting to write a Judge-Your-Neighbor Worksheet. Statement of fact: She interrupted me. She is trying to control me. She doesn’t care about me. She thinks she’s better than me. She’s trying to dominate me. She is not being fair to me. Notice that all of these statements are about her. They are my interpretations of what she is really doing when she interrupts me. Because of these interpretations, her interruption is emotionally charged for me. Sometimes it takes me a day just to do this. And I also take time to consider which interpretation is really at the heart of it for me. It is a practice of paying close attention to my own feelings when I look at what the other person did. The emotions will be different depending on my interpretation. For example, I feel angry when I think she is trying to control me. But I feel defensive when she thinks I’m wrong. And I feel sad when I think she doesn’t care about me. Sifting through these interpretations, and adding any more that come up, is something I like to spend time on. I want to see if it’s really anger or sadness. Maybe both are there, but which one is closer to the heart of it for me? With awareness it becomes clearer which interpretation is bothering me the most. But even if I don’t find “the one” it doesn’t matter. I just pick one and get started writing the worksheet. I know that any of them will take me home. This is what meditating on the stressful experience can show me. When I take my time to identify what is really bothering me about what they did, my worksheet will allow that deepest pain in me to be expressed. And when I write down all the stressful thoughts that are connected to my interpretation on lines 2-6 of my worksheet, it feels like a deep emotional purge. Just writing the worksheet brings relief. The part of me that was silenced is now allowed to speak. And when I get around to actually doing The Work on all of the statements that I wrote, they are so connected to my emotion and what was really bothering me that each piece of work feels like medicine that directly addresses and heals what was really bothering me. And I find that there are layers to it. I may write a worksheet about being “angry that she is controlling me,” and when I’m done with it and the anger has lessened or disappeared, I may find that the sadness of her “not caring about me” is coming up more strongly now. So I may go back for a second pass and write a whole new worksheet based on this second offense, “I am saddened by her because she doesn’t care about me.” It’s the same situation, but it’s a very different worksheet. Like an archeologist, I can peel off the layers one by one until all aspects of my stress have been fully met with understanding. In this way, I don’t feel a rush to move on to another situation to write a worksheet, I can reach all the way to heaven just working this one. The Work will take you as deep as you want to go. Question 4 of The Work of Byron Katie is a powerful question. The question is, “Who would you be without that thought?” In The Work of Bryon Katie, we are questioning thoughts, beliefs, or stories. You start by picking one thought, usually a stressful thought and questioning if it’s true or not, and reporting how you react when you believe it (questions 1-3). Question 4 is a chance to explore new territory. Who would you be without that thought (in the same situation where you were believing it)? Answering this question can open up new worlds. But it can also be challenging at times. 1. Go back to the situation where you were believing the thought. Just like when you answer question 3 (how do you react? ), go back and walk around in the situation again. Be there and go through every experience again mentally, but with without the thought this time. The more specific and thorough you are, experiencing every aspect of the situation again without the thought, the more you will get from question 4. 2. Pretend. The biggest obstacle to going deeper in question 4 is the belief that you have to get rid of the thought. This is not true! You don’t ever have to get rid of your belief when doing The Work. You are just experiencing the effect of it (question 3) and imagining what it would be like without it (question 4). Many people think, “I can’t be without it because I believe it.” But you don’t have to stop believing a thought to pretend who you would be if you didn’t believe it. Take the liberty. Explore. Who would you be without that thought? The thought may be perfectly true. You don’t have to stop believing it ever! Just who would you be without it? Be a kid. Pretend. Just because I can’t fly, doesn’t mean I can’t pretend that I can fly over my house and experience it from the air. 3. Use the subquestions from question 3 again in question 4. Ask yourself what emotions or physical sensations do you experience without the thought, how do you treat the other person, how do you treat yourself, is there any difference without the thought? 4. Take your time. Maybe take ten minutes to really explore who you would be in the stressful moment without the thought. Look at the other person. What do you see when you look at them without your story? Maybe even sit in question 4 for a whole day, thinking about it from time to time throughout your day. It is a meditation. Ernest Holm Svendsen sent me a preview copy and I love it. The comes out in early September. 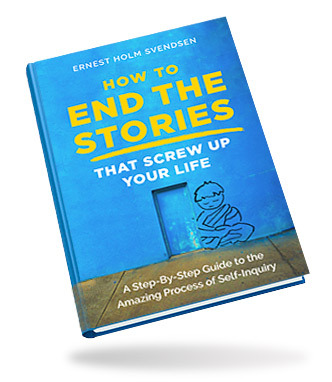 Ernest Holm Svendsen is a certified facilitator of The Work and it is obvious to me that he has been practicing The Work himself for a long time and thinking about how to present The Work to others for a long time. His experience comes through loud and clear as he explains what inquiry is, and all the details of how to do The Work of Byron Katie. I especially love his wonderful analogies which illustrate so many of the points he is making. His clear writing makes inquiry understandable to all levels. I’m planning to read it again! Ernest is promoting the book on Amazon and, for a limited time, he is offering a free (digital) version of the book. If you sign up to his pre-release list, you will receive an email when the book comes out in September with an option to download it at no cost from the Amazon website (if you do it within the first couple of days of the launch period). This helps to ensure a strong launch of the book on Amazon. There is a window in the first few days when they will be increasing the number of downloads by offering the book for free. This helps the book get noticed. These redwood trees have stretched far beyond the comfort of their original seeds. But each step of growth has been gentle, rather than forceful. A way to stretch without using force. A way to remain peaceful even when moving out of your comfort zone. A way to grow without burnout. This is the way nature grows. And it can be helpful to emulate nature in this way when making The Work of Byron Katie a daily practice. In Inquiry Circle, we do The Work more or less on a daily basis. Everyone works at their own pace, but the idea is to keep practicing on an ongoing basis. Making The Work an ongoing practice is a balancing act. It’s a balance between listening to the part of me that wants to stretch and grow and to the part of me that wants to take it easy. If I listen only to one side, I go towards one extreme. Either I don’t engage enough to get the momentum going (even though I want to do The Work), or I engage more than I want to engage, pushing myself towards burnout. In both cases, the result is the same: I eventually quit the practice. To maintain an ongoing practice of The Work, I have to be willing to push out of my comfort zone, but I also must be willing to pull back sometimes too. It’s like driving a car. If I only push on the brake, I will go nowhere. But if I never use the brake, and only use the accelerator, I will surely crash the car. Effective driving comes when there is an ongoing conversation between the break and the accelerator. The driver is constantly adjusting the break and the accelerator based on the conditions of the road. Then she can drive anywhere with ease. Likewise, engaging in doing The Work—maybe even pushing myself a little to do so—may be necessary if I’m stuck in inertia. It does takes some effort to do The Work. But once I get going, slowing down with The Work can also be important. It’s a constant conversation between these two opposites. How are you doing in finding your balance point with making inquiry a steady practice? Are you pushing yourself too hard? Or are you letting it slip? What thoughts are making you push too hard or let go too easily? I suggest writing down the thoughts that keep you from practicing The Work in a balanced way. And, yes, you guessed it: question them! Join me for The Work 101 online course, Sep 2 – Nov 4.